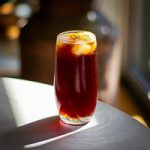 Yes, you can mix some cold brew concentrate with sparkling mineral or soda water, but in our opinion, carbonating the coffee itself is a whole new level of delicious. We recommend using a fruity natural-process single origin or blend as the CO2 will really bring out the bright, fruity notes of these coffees. Very slowly release pressure. It will bubble up quickly, so pay attention. * you can grab a SodaStream for around $70 at your local department store. Note: carbonating coffee is not endorsed by SodaStream. It can get messy if you’re not careful!